The CH60 chain counter and windlass controller displays how much chain you have let out in feet, meters or fathoms. It can automatically slow your windlass when the anchor gets within 5 feet of the bow roller to prevent nasty bumps and scrapes. The slow-down feature is proportional to distance remaining (it slows down more as the anchor gets closer to the bow roller). This makes anchor retrieval at night much safer. The slow-down feature can easily be defeated in if you need to park the anchor quickly in an emergency. Hands-off Auto UP/DOWN: The CH60 can be told to retrieve all the chain automatically, stopping when the anchor gets to 5 feet of the bow roller. You can also program the CH60 to deploy chain automatically, stopping when the programmed amount has been deployed. 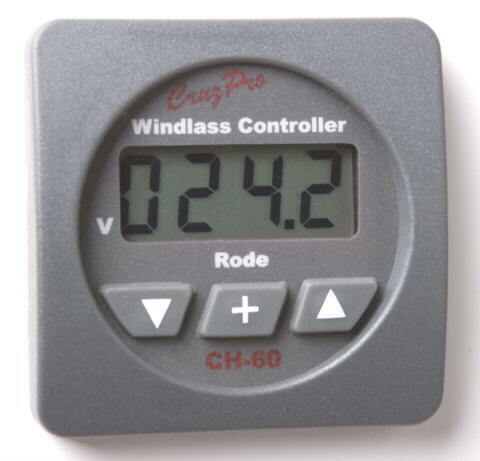 In Auto UP/DOWN mode, the CH60 constantly monitors the performance of the windlass. If a chain jam occurs or the anchor is stuck fast, the CH60 will stop the windlass faster than any human could respond. The CH60 can be programmed to back-jog the chain a few links when you remove your finger from the UP button. This removes tension off the chain, capstan and windlass gears increasing windlass life and automatically "parks" the chain into a chain stopper. 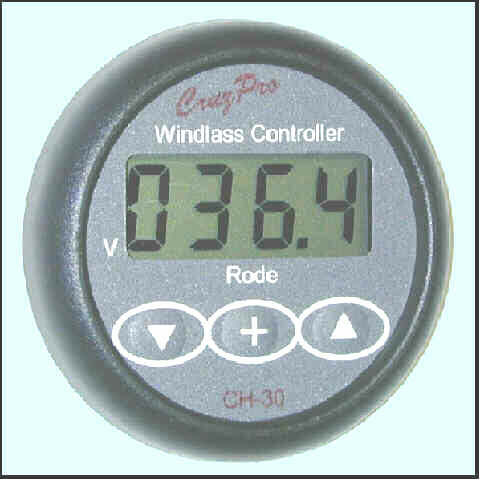 The CH60 can be told to display windlass battery voltage (even under load - when deploying or retrieving the anchor) so you can check the condition of the windlass battery from the helm. The CH60 works over a wide operating voltage range from 6.5 to 33 VDC and can be used to control 12 or 24 VDC winches. All constants and calibrations are pre-set during manufacture but you may alter these settings to suit your particular needs. Calibrations can be altered over a wide range using the front-panel switches. All information is automatically saved to non-volatile memory. You can use the front panel buttons to lower and raise your anchor from the cockpit or helm station. With a press of the button you can display deployed rode in Feet, Meters or Fathoms and windlass battery voltage. You can turn off the CH30 and it remembers how much chain you have deployed and displays the correct number when you turn it back on. The CH60 draws only 0.017 amps and 5 levels of backlight (including OFF) can be selected from the front panel. The CH60 outputs rode and windlass battery voltage on the standard NMEA 0183 ASCII serial data line at 4800 BAUD. This digital ASCII information can be used to log windlass performance, anchoring depth, windlass battery voltage, etc. 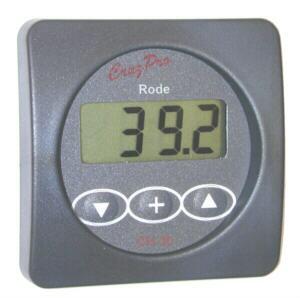 repeat the display information at a remote location (see www.cruzpro.com/rp30.html and www.cruzpro.com/rp110.html).